Pocky is a Japanese biscuit stick usually coated in chocolate. There are many different flavours of Pocky in Japan including almond, strawberry, milk, chocolate mousse, green tea, honey and banana. Pocky is extremely popular in Japan especially among teenagers. It has also spread to other East Asian nations and has a significant presence in both South Korea and China. It has just started becoming popular in Western countries such as Australia, Canada and the United States. In these countries it can be found in Asian supermarkets or grocery stores. My local supermarket has also started stocking it in the Asian food section. In the US it can be found at most large supermarkets such as World Market, Wegmans and Wal-Mart in either the international section or Asian food aisle. 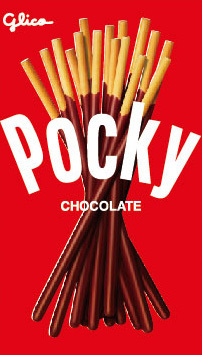 Pocky can be found in dozens of varieties as mentioned above. Some of the more unusual flavours include kiwifruit mango, grape, melon, tangerine, Kobe wine, sweet potato, pumpkin, and soy bean. There is also another types of chocolate biscuit stick similar to Pocky called Fran. This is a different brand, but is also delicious and the stick is thicker than Pocky. One of my most favorite snack, after trying most of the taste, the original chocolate is the best. Thanks Antleeli, there are so many different flavours it is hard to choose a favourite.